A Möbius strip is a loop with unusual geometrical properties. Select one spot on the sculpture and imagine tracing a toy car running around the track and returning to the starting position. How does this shape differ from a normal loop or ring? Möbius strip geometry has been studied by mathematicians since the 1930s, but it is still being studied today. 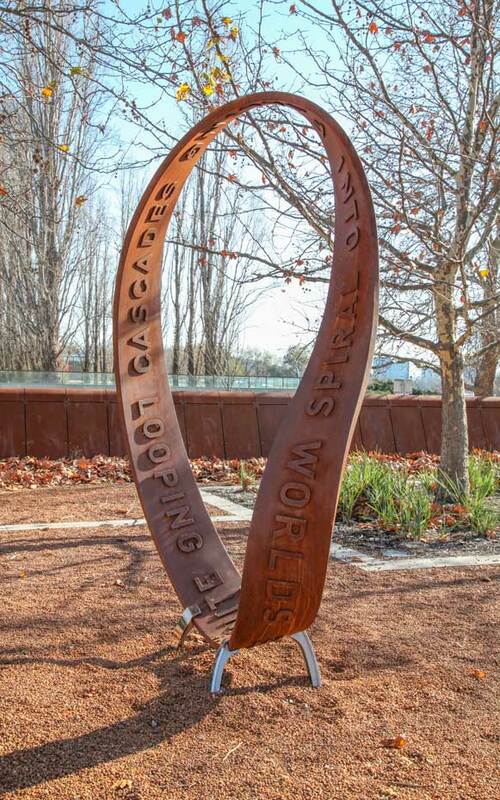 A Möbius strip is a closed loop that contains a half-twist along one part of the loop. This small twist creates an intriguing topological property in that the Möbius strip only has one side, while a normal loop (without a half-twist) contains two sides. The way Möbius shapes deform in space has been applied to studying biological macromolecules and a Möbius shaped crystal has been grown in a laboratory. The topology of a Möbius band has also been used to explain why a coiled telephone hand-set cord frequently exhibits regions of both left- and right- handed helices.